What does #Beinyourskin really mean? To me it means loving your body now, not waiting till you reach your goal weight or waiting until you've fit in two more workouts. Loving who you are in your body, flaws and all, now. 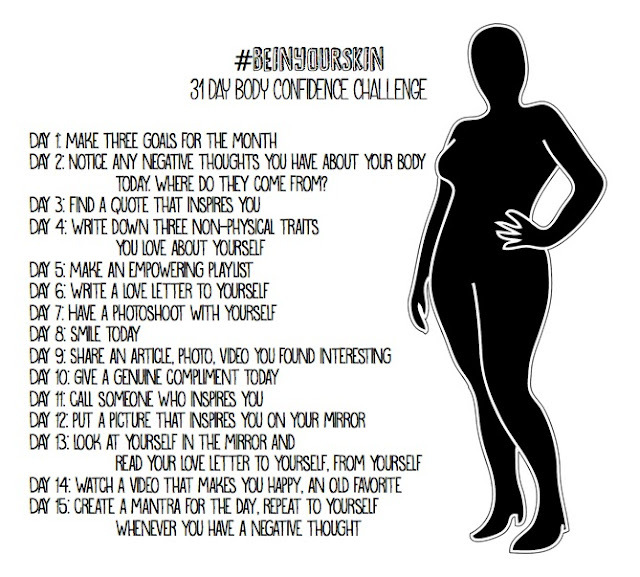 I'm extremely passionate about self-love and body positivity, so in that spirit I created the #BEinyourskin 31 Day Body Confidence Challenge. I'm so excited about this challenge because it's not about changing your body physically, it's about noticing how your thoughts and your mentality effects your body image. By combating negative body talk, you are creating a space where only positive things can happen. Five beautiful, talented and passionate women took the pledge with me to take the challenge. We filmed a roundtable discussion about body image, body confidence and how that effects our lives, so look at for that three part video! I will be sharing it on here and on all social media. I'm so excited for you all to see that! It's amazing to see that everyone has similar experiences, you are NOT alone. Please comment below if you want to pledge to taking the challenge! Follow us using the #BEinyourskin on Instagram, Twitter, Tumblr and Facebook. Works Cited - Paul, Steve. “TestoFuel Research: Benefits, Side Effects & Where To Buy Guide!” Testosteroneofficial.Com Ie. Testosterone Official, https://testosteroneofficial.com/reviews/testofuel/. Accessed 30 Aug. 2018.